The thickness of polythene sheeting is measured in gauge (g) or microns (m). Gauge was the traditional imperial measurement of polythene thickness which has now been replaced by micron as the European metric standard. The higher the number of gauge or micron, the thicker the polythene sheeting is. The gauge of polythene can easily be converted to micron by dividing it X 4. Also, if you want the thickness in millimetres then just divide the gauge by 4000. As an example, 1000 gauge = 250 micron = 0.25mm. Light duty Polythene Sheeting (62.5 micron or 250g) - ideally protection when painting, spraying or as a dust cover and for light duty general wrapping for storage and transit. 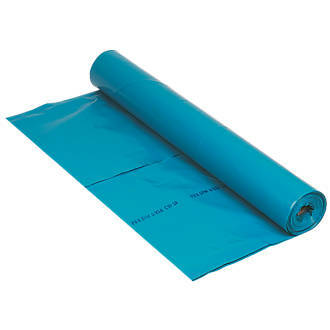 Heavy Duty Polythene Sheeting (250 micron or 1000g) - Perfect for heavy duty applications such as a DPM damp proof membrane, for mixing cement, temporary roof covering, temporary window repairs, industrial protection, weather protection and for heavier duty wrapping for storage and during transit.